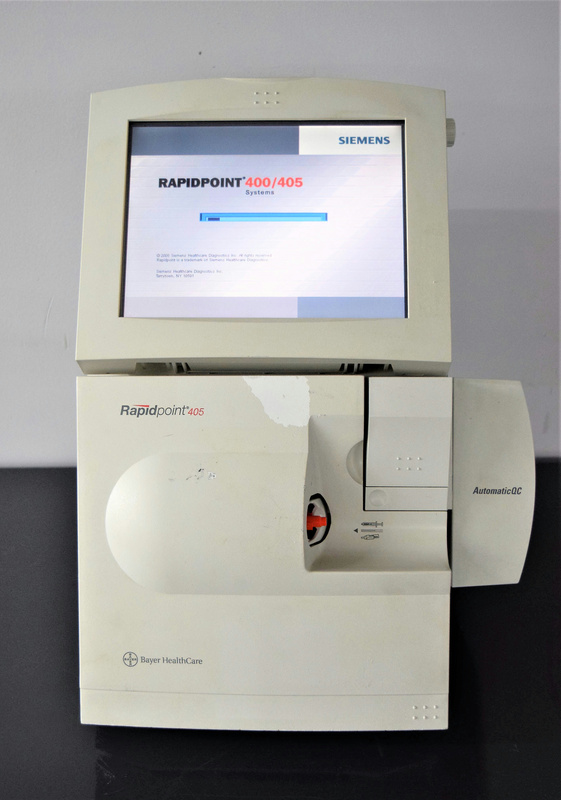 Siemens Rapidpoint 400/405 Blood Gas Analyzer Clinical Diagnostics Hematology . New Life Scientific, Inc. This equipment has minor cosmetic wear and passed the technician's basic-functionality testing. New Life Scientific technicians powered the analyzer on and it passed initialization, with all motors responding.This product does not include consumables and the technicians recommend maintenance prior to application. Fast test results mean quicker decisions for earlier treatment. With our RAPIDPoint® 400/405 Systems you receive the same benefits of speed, operator safety, and proven reliability that make our high-volume RAPIDLab® Systems so popular. One of the first true point-of-care systems in the market to bring comprehensive lab-quality testing to the patient's bedside, RAPIDPoint 400/405 Systems provide accurate results you can depend on. full CO- oximetry from a single sample. This equipment has some minor cosmetic wear. The instrument powers up and initializes, but it was not fully tested. The password is unknown.